On Thursday evening, my brother Tom and his wife, Jill, hosted a “Sibling Dinner” at Fleming’s in Radnor. Tom, John and myself, along with my sisters Cathy and Mary Ann, were joined by our spouses, Jill, Kathy and Joanne, along with special guests, Matthew and Jenna Mitchell, who are two of Tom’s closest friends. It was a great evening of laughs and conversation as the Mitchell’s got to hear a few of our family secrets and he and his lovely wife entertained us with tales of growing up in the South. Matthew just completed a very successful year as coach of the University of Kentucky’s women’s basketball team which finished 28-8 and earned an appearance in the Elite Eight of the NCAA Women’s Tourney. Matthew was named Southeastern Conference Coach of the Year. Matthew maintains his humility in light of his accomplishments and his wife Jenna makes sure that he stays that way! Flemings has a nice wine list with over 100 wines by the glass. We chose the 2006 Patz and Hall, Russian River Valley, Dutton Ranch, Chardonnay, the 2006 Ghost Block Cabernet Sauvignon, and the 2007 Adelsheim Vineyard, Pinot Noir, Williamette Valley. 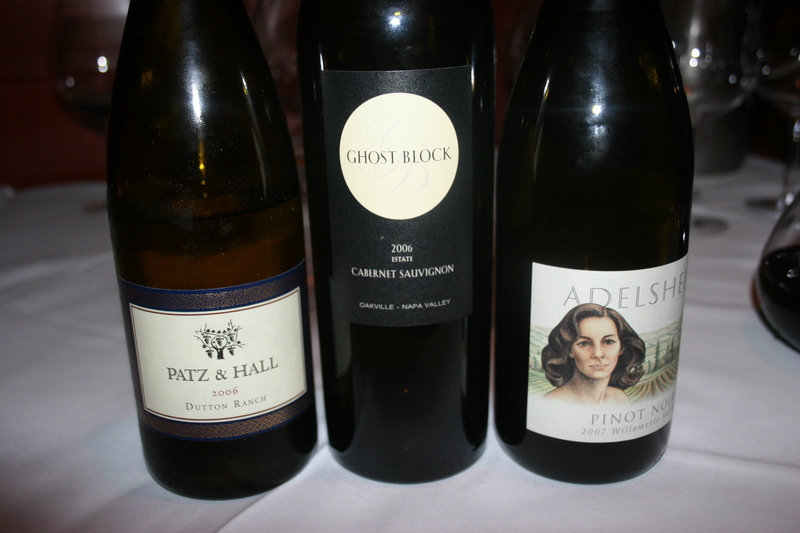 The Ghost Block was very good and a perfect match for the steaks served at Flemings. The Adelsheim Pinot was rich and flavorful and was a nice sipping wine. It might be noted that some of the wines by the glass are extremely high-priced in relation to what the wine sells for locally. Two examples would be the Pillar Box Red (an Australian shiraz blend) available at $9.75 a glass at Flemings and sold currently as a Chairman’s Selection in PA State Stores at $6.99 a bottle and the Bommarito Cabernet at a hefty $19.50 a glass and available in the stores as another Chairman’s Selection at $14.99 per bottle. 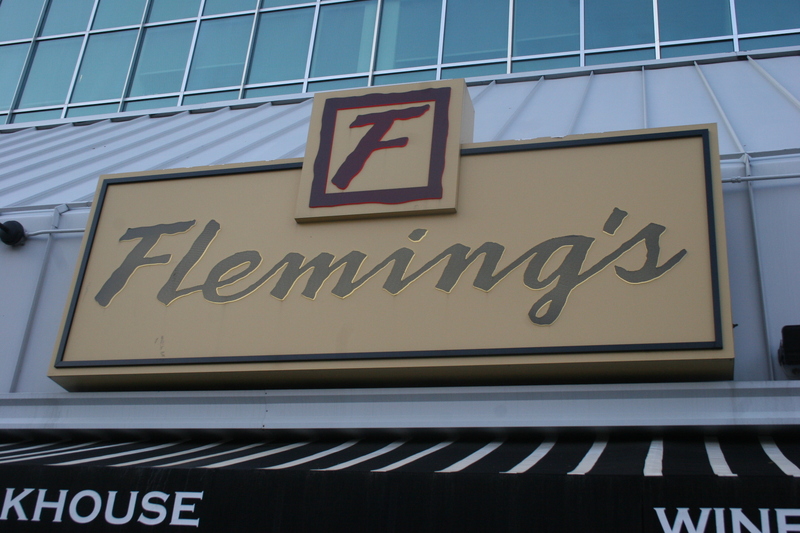 The staff at Fleming’s were especially accommodating as Kyle, the Manager, went out of his way to provide us with a round table for ten and Jill, our server, in addition to providing helpful menu advice, made frequent appearances to keep us abreast of scores on the Flyers, Phillies and also, draft picks, as the NFL draft was taking place in NY. Most of us started our meal with a soup or salad. My Wedge was fresh with lots of crisp bacon, ripe tomatoes and creamy chunks of blue cheese. John and MaryAnn loved the French Onion soup which is prepared with three different cheeses. 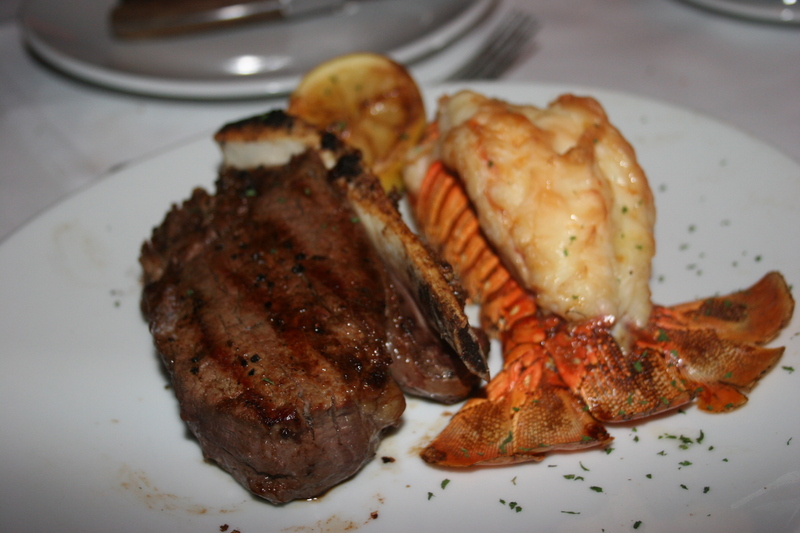 Kathy ordered the Surf & Turf which featured a medium bone-in steak and an Australian lobster tail with lemon and butter. She really enjoyed as much as she could and took a nice portion home for another meal which she generously let me have last night. It was still good the next day, especially the lobster. 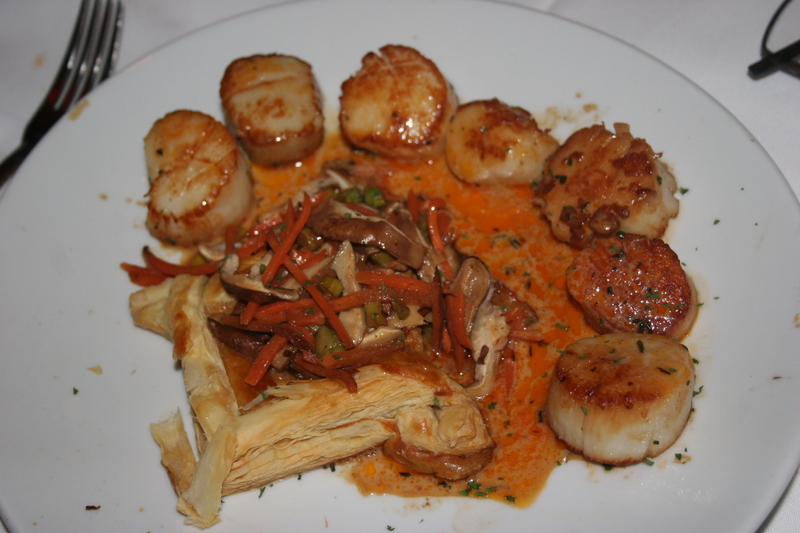 I think John’s entree looked the best of all of them as his Seared Scallops in a lobster creme sauce accompanied with a puff pastry of sauteed fresh vegetables looked absolutely delicious. John was very pleased with his choice. My sister, Cathy ordered from one of the evening specials. 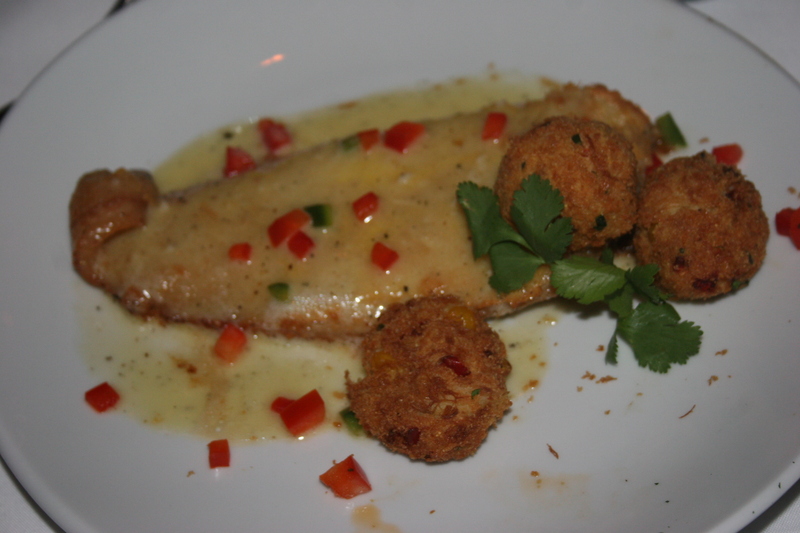 I believe it was a filet of sole with hush puppies. 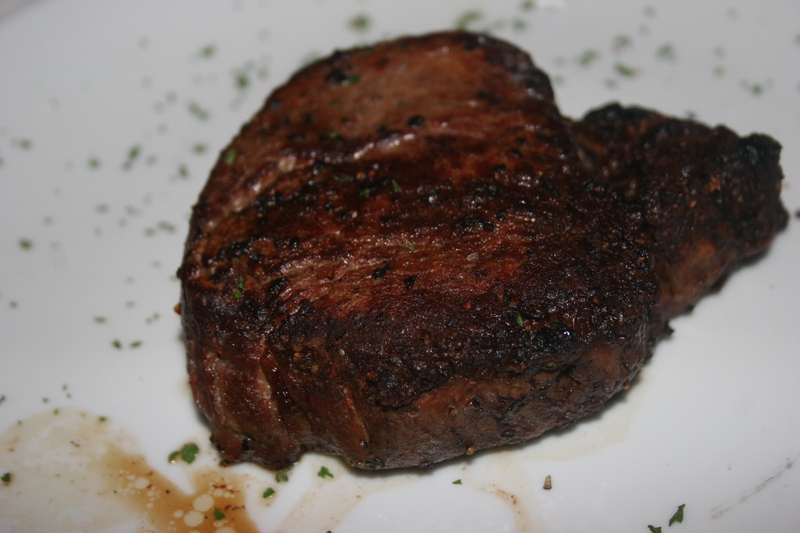 I had the Filet Mignon and it was cooked perfectly and very flavorful. 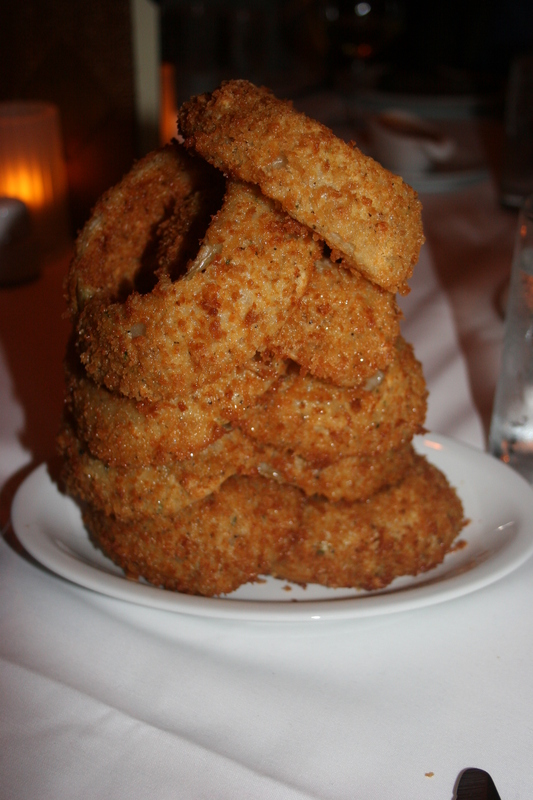 We had ordered several sides for the table, the Flemings potatoes, a house specialty made with creme, jalapeno and cheddar cheese, excellent, I might add, creamed spinach and sauteed spinach and our final “SIDE” , the inappropriately named “onion rings”. I was thinking “Gigantic Tower of Onion Rings” would have been more appropriate. These were not only enough for our table but may have fed Matthew’s entire U of K basketball team with leftovers to take home. They came with a tangy jalapeno aoili and were delicious. Everyone seemed to enjoy their meal and since both the Flyers and Phillies had won we were all in a good mood and ready for dessert. 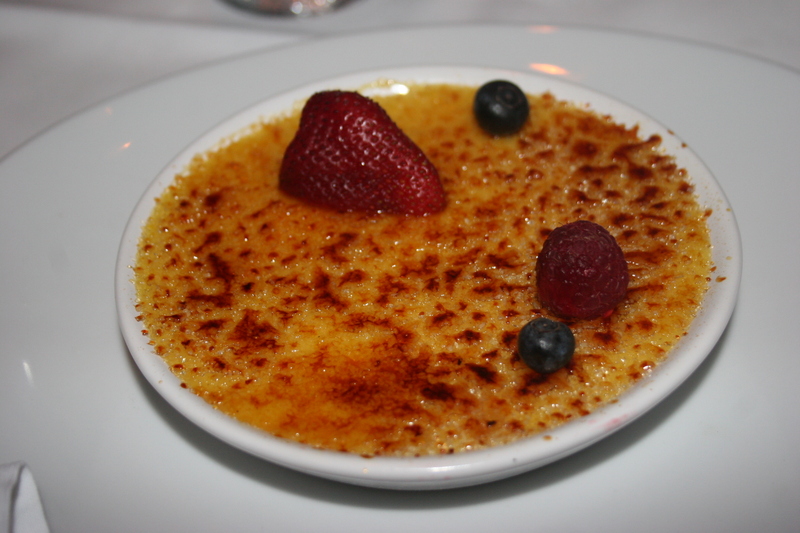 I think I saw a cheesecake or two on the table and I know I saw others besides myself with the Creme Brulee . It had a nice crunchy layer and a perfectly prepared center topped with fresh blackberries and strawberries. It was a great way to end a very good meal. It’s nice to have an opportunity to spend some time with family members in a nice setting like Flemings with good food, wine and friendships. My thanks to Tom and Jill for arranging this. Best wishes to Matthew and Jenna for continues success.